Born January 17th, 1899, Al Capone was the first American-born child of Gabriele Capone and Teresa Raiola-Capone, both who had immigrated to the United States from Italy. He was one of nine siblings. His father was a barber and his mother was a seamstress. Al was raised as a Roman Catholic in Brooklyn, NY. At the age of 5, he started school in a public education system that was not tolerant of immigrant children. As a result he was often subjected to the abuse of physical force as a form of discipline. That lasted until the age of 14, when he ended up in a fist fight with a teacher, was expelled, and never returned to formal schooling again. Although the first 14 years of his life were an influencial hardship, the next 4 would eventually become the deciding factor on how he would live the rest of his life. After his expulsion, his parents moved the family to 21 Garfield Place, another neighborhood where gangs provided “street school” for newcomers. He soon joined the the Brooklyn Rippers and the Forty Thieves Juniors, where he made his first connection with Johnny Torrio and Lucky Luciano. NY taught him the fine arts of the numbers and gambling rackets. In 1917 he received his scars from the knife of Frank Galluccio. In 1965, Galluccio gave an interview about what happened. In 1918, Al met Mary “Mae” Coughlin at a dance, they married and on December 4th, 1918, she gave birth to Albert Francis “Sonny” Capone. After his marriage, and at the invitation of his old friend Johnny Torrio, Al moved his family to Chicago in 1919. Once there he went to work as an enforcer/bouncer for Big Jim Colosimo. Al now added prostitution to his rackateering expertise. On May 11, 1920, Big Jim was murdered in his office, and the succession plan immediately placed Torrio at the head of the Chicago Outfit. Al became second in command at the age of 21. When the US Government enacted the Volstead Act that same year, the lucrative opportunity of the illegal booze business was born. Hundreds of existing speakeasies and thousands of closed taverns/saloons made for an ideal distribution network for Torrio’s syndicate. Thus the beer wars began for control of the rackets. In 1925, Torrio survived an attempted assasination that placed him into the hospital with nearly-mortal bullet wounds. After ample recuperation and self-reflection, he resigned his position by appointing Al as the new leader of the Chicago Outfit. Al Capone had achieved the rank of CEO, of the largest organized crime ring in the world, at the age of just 26! syndicate structure and effectively refined the racketeering business. • Made The Cover of Time Magazine on March 24, 1930 Although Al Capone was alledged to be resonsible for hundreds of murders across the U.S., not one murder conviction exists anywhere. His eventual imprisonment resulted from a federal charge for income tax evasion, and at a time when the entire U.S. economy was based on cash. In 1928, the same year that the land for the Miami Gardens roadhouse was purchased, Al’s lawyers acquired his 14-room Palm Island, Miami, Fl., estate from August Busch. The home was purchased for $40,000 in cash, and is located just 16 miles away from Miami Gardens, Florida. From 1928 until his death in 1947, he used this estate as his family’s home. His wife and son were full time residents, away from the Chicago business. Al was known to travel back and forth, thus facilitating the need for safe places to stay, like Miami Gardens in Peotone, Il, when conducting Outfit business. Born January 18th in 1899*, Al Capone was the first American-born child of Gabriele Capone and Teresa Raiola-Capone, both who had immigrated to the United States from Italy. His siblings, in the order of their birth, are Vincenzo, Raffalo, Salvatore, Alphonse,Amadeo, Umberto, Mathew and Rosalia. His father was a barber and his mother was a seamstress. *Commonly reported as 1/17, we confirmed this date with Deidre Marie Capone. In her book “Uncle Al Capone” it was misreported as 1/24. Al was raised as a Roman Catholic in Brooklyn, NY. At the age of 5, he started public school in a system that was not tolerant of immigrant children. As a result he was often subjected to use of physical force as a form of discipline. That lasted until the age of 14 when he ended up in a fist fight with a teacher, was expelled, and never returned to formal schooling again. Although the first 14 years of his life were an influencial hardship, the next 4 would eventually become the deciding factor on how he would live the rest of his life. After his expulsion, his parents moved the family to 21 Garfield Place, another neighborhood where gangs provided “street school” for newcomers. He soon joined the gangs known as the Brooklyn Rippers and the Forty Thieves Juniors, where he made his first connection with Johnny Torrio and Lucky Luciano. NY taught him the fine arts of the numbers and gambling rackets. In 1918, Al met Mary “Mae” Coughlin at a dance, they married and on December 4th, 1918, she gave birth to Albert Francis “Sonny” Capone. After his marriage, and at the invitation of his old friend Johnny Torrio, Al moved his family to Chicago in 1919. Once there he went to work as an enforcer/bouncer for Big Jim Colosimo. Al now added prostitution to his rackateering expertise. On May 11, 1920, Big Jim was murdered in his office, and the succession plan immediately placed Torrio at the head of the Chicago Outfit. Al became second in command at the age of 21. When the US Government enacted the Volstead Act that same year, the lucrative opportunity of the illegal booze business was born. Hundreds of existing speakeasies and thousands of closed taverns/saloons made for an ideal distribution network for Torrio’s syndicate. Thus the beer wars began for control of the rackets. In 1925, Torrio survived an attempted assasination that placed him into the hospital with nearly-mortal bullet wounds. After ample recuperation and self- reflection, he resigned his position by appointing Al as the new leader of the Chicago Outfit. Al Capone had achieved the rank of CEO, of the largest organized crime ring in the world, at the age of just 26! During his 7 years as top mob boss in Chicago, Al improved the Chicago syndicate structure and effectively refined the racketeering business. Alcohol prohibition proved to be the catalyst for growing his organization into a permanent part of society. His “street school” education combined with his early physical abuse (by his teachers) had greatly paid off, for he had learned to effectively exploit vices for income, and use physical force for enforcement. During his time in office, his accomplishments included: • Annual Revenue $105 Million ($1.5B today) • 600+ Full Time Employees • Thousands of Speakeasies and Taverns/Saloons • Personal Net Worth $1.3 Billion • Achieved Most Popular Man in Chicago • The Cover of Time Magazine on March 24, 1930 Although Al Capone was alledged to be resonsible for hundreds of murders across the U.S., not one murder conviction exists anywhere. His eventual imprisonment resulted from a federal charge for income tax evasion, and at a time when the entire U.S. economy was based on cash. 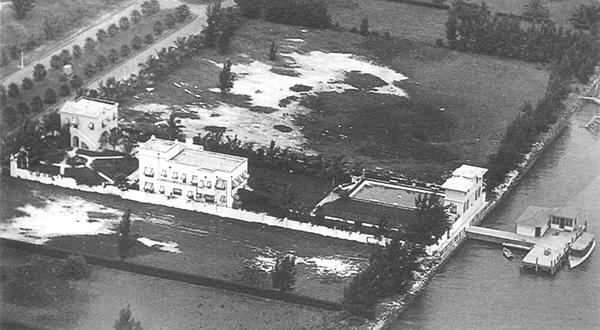 In 1928, the same year that the land for the Miami Gardens speakeasy was purchased, Al’s lawyers acquired his 14-room Palm Island, Miami, Fl., estate from August Busch. The home was purchased for $40,000 in cash, and is located just 16 miles away from Miami Gardens, Florida. From 1928 until his death in 1947, he used this estate as his family’s home. His wife and son were full time residents, away from the Chicago business. Al was known to travel back and forth, thus facilitating the need for safe places to stay, like Miami Gardens in Peotone, Il, when conducting Outfit business.